Problems occur for organisations when they start collecting data and then, after the data has been collected, ask themselves what they can do with it. Often, they realise that they have not collected a key piece of data, or that they have collected too much, and so have paid for data they do not need. So, our advice to clients is to be 100% clear on how you will use the data you collect BEFORE you collect it. This can be a frustrating task at the start of a project when everyone is excited about what the data will show and just want to get going with the data collection, but it’s like building the foundations for a house – you spend a lot of time digging down with little to show for your efforts, but without this investment, the building will fall. A clear data framework is the foundation for any project involving data collection. Once the data has been collected, you need to make the most of your investment. Using the right tools to analyse the data helps increase the value of the project. Sometimes we see investment wasted because the data that has been collected is not analysed effectively. This is something we want to help clients avoid and so have developed tools on our web platform to help with data analysis. In a GeoTraceability System, all the data gathered on each smallholder (for example production, household, training, credit, payments, inputs provided) is recorded in a ‘supplier profile’ (see diagram 1). It is also possible for the system to make automatic calculations using the data gathered – for example if you know the size of a farm and the annual yield, the system can automatically calculate yield per hectare. If delivery data has also been collected, you can estimate the amount of side selling occurring. In addition to viewing the data on each individual farmer, the results for all the farmers are aggregated. The results can be viewed in a number of different formats: bar graph, pie chart, table, and thematic map. At any point, you can capture the result, a graph for example, by saving it on a pin board (see diagram 2). The pin board lets you group results under different categories, which you can manage. The results can then be integrated into a PowerPoint or Word document at a later date. You can also combine different indicators and do a multi-criteria analysis. For example, the producers who delivered in February, have over 40 years old and apply over $500 value of fertiliser. This iteration creates a ‘story’ that you can save and re use after (see diagram 3). It can also be used to monitor project indicators, such as the number of women who have been trained on how to prune. If the above functions don’t give you the insight you’re looking for, you can also us the Pivot Table on the web platform (see diagram 4). Here different pieces of data can be seen in relation to each other as you make a simple matrix, for example, the distribution of age per gender. But you can also add a third dimension, like production, to see if the gender and the age impact production. You can express the result as the average production for female farmer in the range 21 to 30 years or the tonnage produce by this group. You can also add a forth or a fifth dimension and so on to see if other factors impact production, like the household revenue or the average distance to the nearest clinic. Once you’re happy with your analysis, you can save it on Excel on a click of a button (see diagram 5). With the GeoT tools you can analyse your data from any angle. For example, show me first the producers who grew peanuts on their farms, and then, looking at only this sub-section of producers, which containers shipped to my clients contain their cocoa beans. Or the other way around: one client says they found peanut residue in a batch of cocoa butter they processed with the beans you supplied, so they want to know if some producers who have contributed to this batch grow peanuts. This shows how you can easily understand the power of the System to prevent contamination or to manage product recalls, as an example. You can learn more on data analysis by getting in touch with us (https://geotraceability.com/contact-us/). The three pillars of supply chain development are Trust, Transparency and Sustainability. This can be difficult to achieve when smallholder farmers and artisan producers in developing countries are involved at the start of the supply chain. However, this is where GeoT focuses, offering innovative technology systems to help companies working with smallholder farmers and artisan producers. Trust and transparency are achieved through geo-data collection on the production of goods and tracing the movement of those goods from farm to export. The information gathered can then be used to support sustainability initiatives and monitor their progress. However, our latest feature – the Alert System – allows companies to go one step further. In many supply chains, accurate timely data is important for managing and coordinating activities, whether this is organising delivery trucks or monitoring the quality of produce. With the GeoTraceability System, it is now possible to gather data on independent farmers, trace produce from these farmers through the supply chain (even when middle men are involved), record delivery of goods at processing plants, and send alerts (via email or SMS) when there are delays in the delivery of goods or issues with the quality. This allows action to be taken in a timely fashion. Whether you are a commercial company looking to improve your supply or implementing a development program to improve farmer livelihoods, the new Alert System (combined with the suite of other GeoT tools saves time and hassle). Instead of having to regularly check the data to be aware of issues, you can set-up alerts for the areas that matter most for your business and supply chain. The geo-data collection on farmers and farming practices combined with the traceability data allows you to target initiatives where they are most needed. The Alert System is another tool for monitoring the success of initiatives and improving the supply chain. Our competitive rates and flexible fee structure, means this is also an affordable option for many organisations. You can learn more about the System by reading the case study below or by getting in touch with us (Contact us). A key challenge in the palm oil supply chain is minimising the time between when the fruit is harvested and processed. The quality of the Fresh Fruit Bunches (FFBs) deteriorates very quickly and it should ideally, be processed within 48 hours of harvesting. However, this can be a challenge for the mills purchasing fruit from independent small holder farmers who are farming in remote locations. The new GeoT Alert System allows those managing the logistics of the supply chain to be informed when the time between harvesting FFBs and processing them is in excess of 48 hrs. This allows the FFB procurement team to monitor these instances and minimize them in order to improve FFB quality and the oil extraction rate. In addition, alerts can be sent notifying the logistics team of farms where there is fruit that has not been collected and is still sitting on the roadside. This transparency can facilitate an efficient collection process. 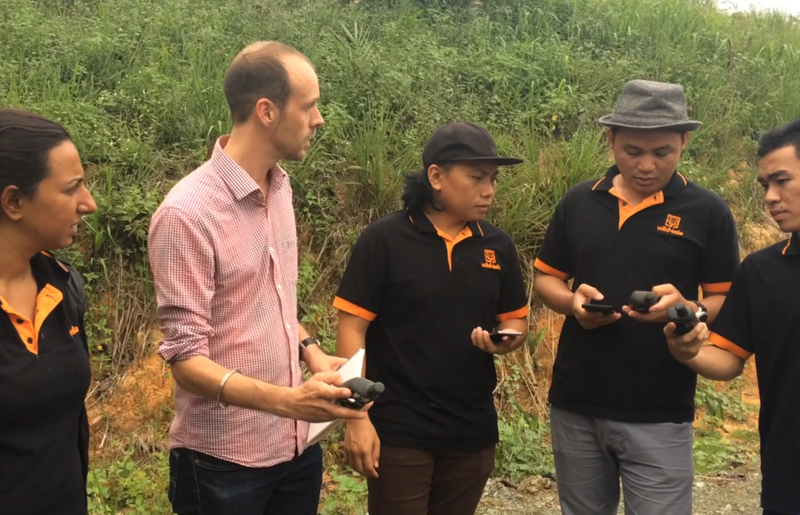 Over the last two years Geotraceability has been working with the largest names in the palm oil sector to develop a ground-breaking software solution to assist with some of the industry’s key sourcing challenges. Geotraceability’s purpose is to better integrate small-scale farmers in global supply chains. We do this by providing tools to, improve supplier relationship management, deliver traceability, increase FFB volume and quality for the mill, then, using the same data, we can simultaneously produce individualised Farm Business Plans, to improve smallholder productivity and livelihoods. Following the completion of a successful prototype, we can now offer this solution at a very attractive commercial rate both for initial set-up and on-going cost. See the GeoT for palm oil briefing for more information and please get in touch if you’d like to see a demo of the solution or have any questions. Please also note that Geotraceability will be at the upcoming RSPO EU Roundtable in London, June 12-13th, 2017, and we’d be happy to arrange a meeting with you in person. GeoTraceability can now develop the tools needed to carry out a survey in just 30 minutes. Why are we so excited about this and what does it mean for our customers? Inspired by the Rio’s Olympics, GeoTraceability’s IT team has taken only 30 minutes to activate a field survey on smallholders. Our previous record was over 24 hours! First what do we mean by a field survey? A field survey lists the data you want to gather on smallholders and their production. This data could include information on a person’s education, sources of income, the agricultural practices they adopt, their opinions – whatever you need. We’re talking about hundreds to thousands entry points per survey multiplied by the number of smallholders reached. Create a web account, a project and its associated geographical ‘levels’. Upload and process the questions, possible answers, their attributes and formats (mandatory or not, value, date, number, text, choices, range…). Prepare the database to receive, validate, process and load the data and activate the ‘workers’ managing these tasks. Set up the ‘APIs’ that links the different data sources and synchronise them. Build the web pages with their query and analytical functions that will allow data visualisation and analysis. Upload the survey forms to mobile devices used to collect the data. Synchronize the web database with the mobile devices for data upload. It took 30 minutes to complete the steps above. In less then an hour, the mobile devices were ready to gather and upload data, and our Web Platform was showing the results. This process is fully automated meaning we offer an almost immediate, cutting edge and low cost technology to gather field data, securely host it on the Cloud and provide powerful analytic tools to use it and share it. Our advice: don’t rely on Excel anymore for your data collection projects, however big or small? Contact us at info@geotraceability.com if you want to learn more about our technologies and improve the efficiency of your data gathering processes.